Beautifully presented Le Praline chocolate box from the world famous Italian chocolate maker, Amedei. 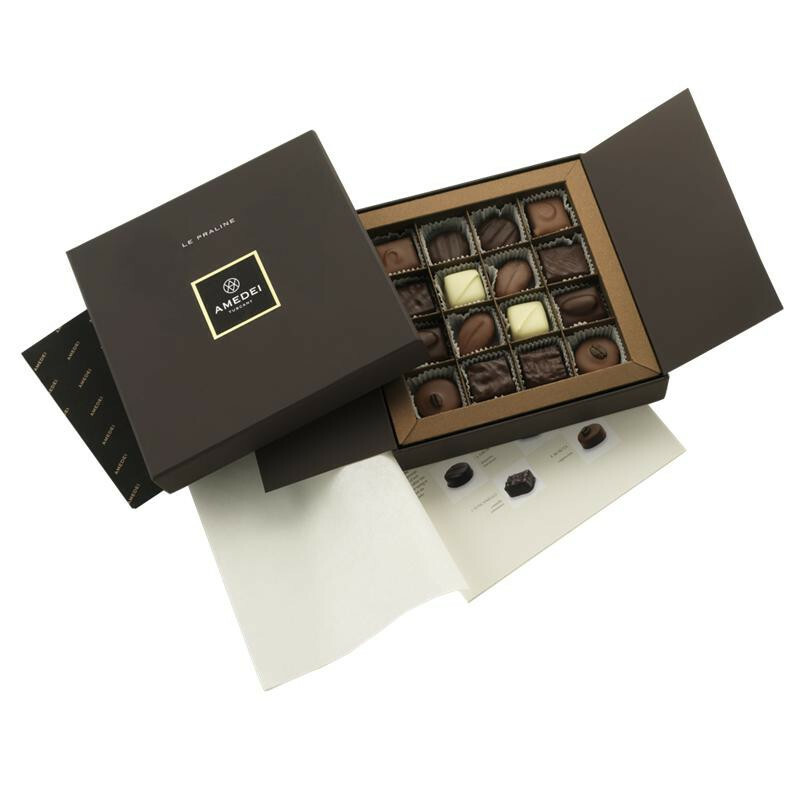 Containing a selection of 16 of superior quality dark and milk assorted handmade filled chocolates. The perfect chocolate gift with a beautifully presented box. Internal ingredients: cane sugar, cocoa mass, whole milk powder, skimmed milk powder, hazelnuts Tonda Gentile Trilobata, dextrose, inverted sugar, glucose syrup, cocoa butter, coffee beans, almonds, pistachios, walnuts, honey, puffed rice, anhydrous cow's butter, natural flavours, stabilizer sorbitol, acidifier citric acid, tartaric acid. Amedei Chocolates of Tuscany strives to bring forth the beautiful poetry and artistry that only the world's rarest and finest chocolates can achieve. Amedei is the synthesis of the best soil, cocoa genetics and raw materials; an exclusive craft-based production process, and the passion and creativity of true lovers of chocolate.